Melbourne-based Microflite Helicopters deliberately targets the “upper end” of the charter, corporate and aerial filming roles with a growing fleet of new and near-new Eurocopter helicopters. 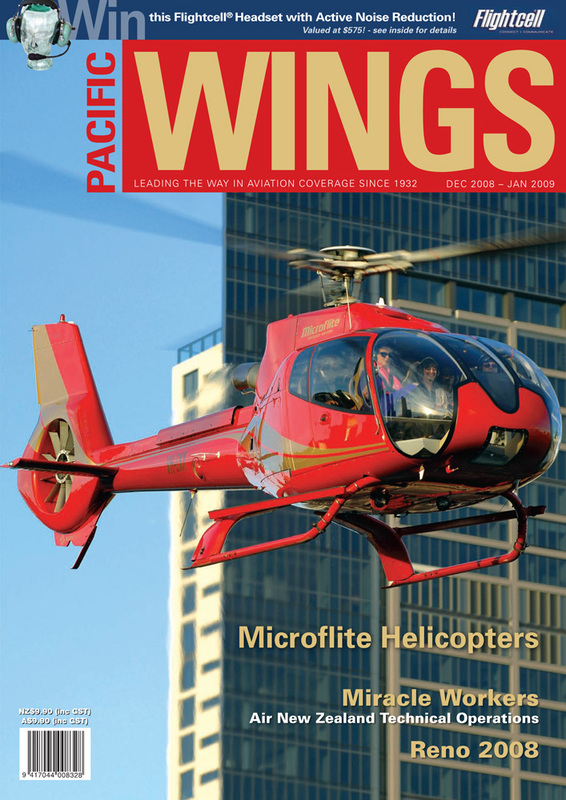 Pacific Wings visited the company with the nice red helicopters on the big red continent recently. Graeme Claridge summarises a very successful first 80 years of operations by the Hawkes Bay and East Coast Aero Club. Pacific Wings recently followed one of Air New Zealand’s Boeing 737s through the most extensive routine check it will get during its life. The inside story (literally) of what is involved in major airline maintenance reveals that miracles are daily routine for aircraft engineers. Doug Moulin is an award-winning nature and landscape photographer—he is also an occasional Pacific Wings contributor and a regular visitor to the annual air races at Reno, Nevada. Pacific Wings’ UK correspondent, Peter Cooper, was one of the brave/keen/crazy spectators to brave the drenching rain and blustery wind at the 2008 Yeovilton Air Day to bring readers the good photographs.